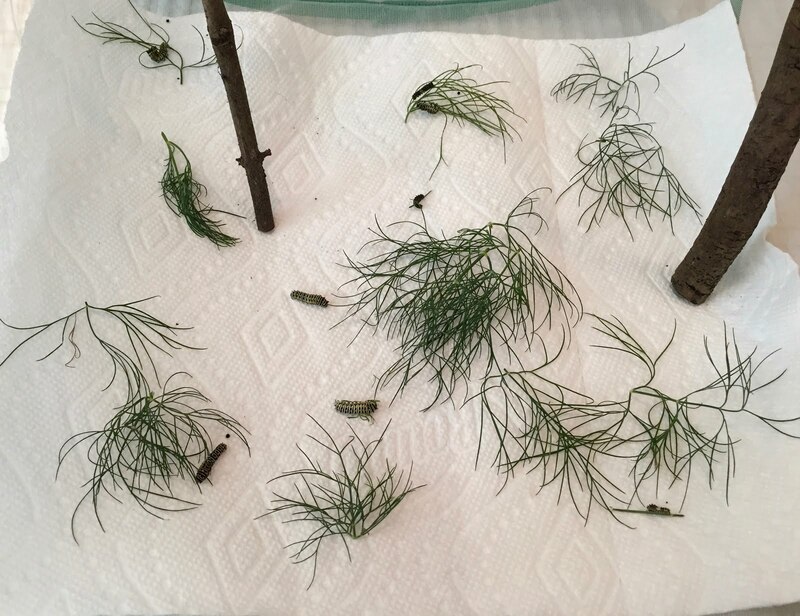 The Black Swallowtail Caterpillars are doing awesome! They are eating, moving around and climbing...they are so much fun to watch. It is especially fun to watch them eat! a few are still tiny but they are active and eating. When I woke up this morning, there was not one piece of dill in there cage/home. Above is what I had given them last night. The bottom of their cage looks like this, after I have cleaned it and given them new food. soon I will have to double the quantity, they really eat a lot of dill. No worries there, I have a ton and it is still growing. I may need a few more sticks! I will take them, and a large supply of dill, with me. they are so easy to care for - and they are bringing me so much joy!! That's awesome, Debbie! You're such a kind person. I love that you are doing this. One year I had brought a habitats for monarchs. It was so much fun. 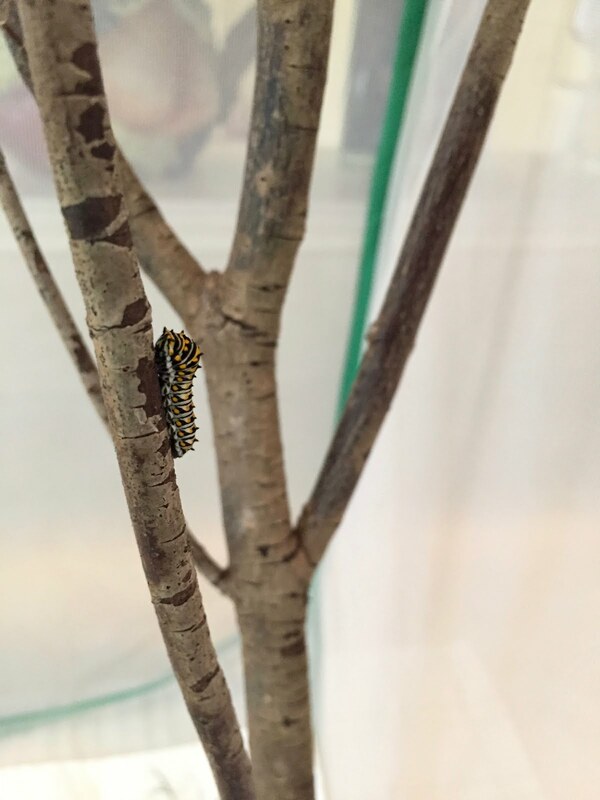 We actually had the chance to watch two spin their chrysalis. Needless to say we did nothing that ex crept crowd around and watch. Thanks for sharing this awesome miracle. Hugs! Kudos for taking care of these incipient butterflies. Hello, what a neat process. You are like a mother to them. It is nice they are going on a road trip too. Have a great day and safe travels. You're taking them with you? That is about the sweetest thing I have ever heard! You are a real gem, Debbie! we are bringing them with us jill because i don't have anyone i trust enough to watch them. and if i asked someone, they would have to come here twice per day to pick dill. i don't know, i guess i could give them dill, it could be refrigerated, but quite frankly, they are at a vulnerable stage and i would feel better if we had them with us. it won't be any trouble!! hi denise, they are at risk outdoors, many are eaten by predictors to them. there has been a decline of the number of butterflies recently so raising them indoors is encouraged!! They will be well cared for and well traveled, Debbie! I love to see their progress! 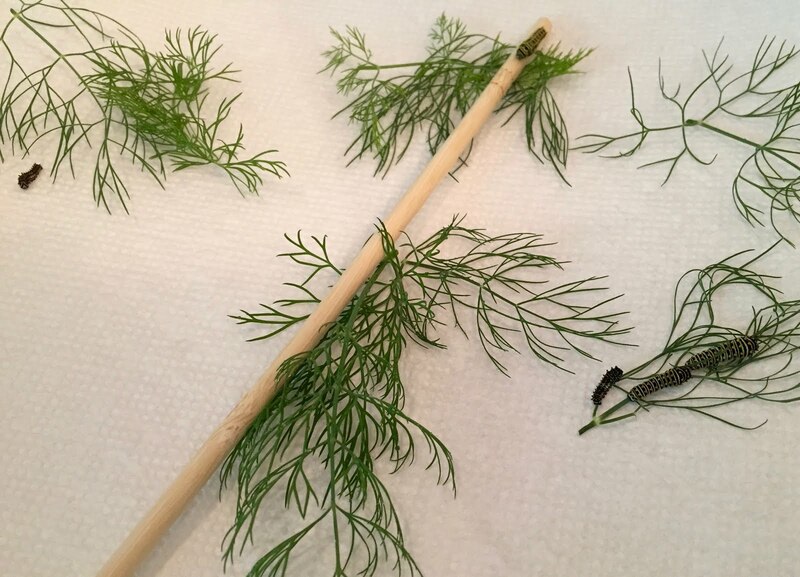 Those caterpillars are living quite the life - an endless supply of dill, maid service, and a road trip to Mystic! Lucky little bugs - I'm looking forward to the rest of this story! oh my goodness!!?? ?--they ate ALL OF THAT? Wow!--you are going to have some beautiful butterflies!! Cant wait to see them! I love how you are mothering them. You know how to nurture well. 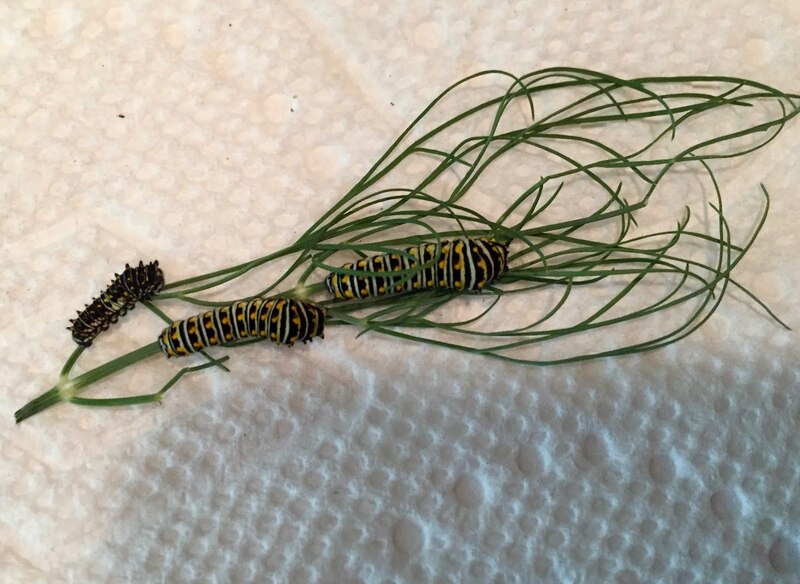 I have to smile that you are traveling with these interesting and amazing caterpillars. Love following your journey! Have a sweet trip. Blessings and hugs! Amazing!!!! You are such a fascinating lady! Amazing! You have chosen an unusual hobby, but useful and fun! I am glad you are enjoying raising these creatures. Road trip! LOL! That will be fun! You're not kidding about the eating! They are growing so well. I think it's great that you are taking them with you on your road trip. What fun, thanks for sharing their stages!